Workshops last between one day and five days, providing an opportunity to intensively develop your chosen area. All workshops are fully tutored and run as a series of exercises so you understand what you are doing, and feel in control. Each day is designed very carefully so that you reach a new understanding of the medium, in such a way that you can remember it and put it into practice at home. All artist-quality materials are provided. This is perfect if you haven’t drawn for a long time, or if your painting is suffering and you need to Regroup. Big Drawing Days are the beginning of the rest of your creative life. A series of exercises that Julie has designed and redesigns, helping you to learn to draw what you really SEE (as opposed to what you think you see!). These classes are very popular, and will make you view your own drawing as well as the whole notion of drawing, in a whole new way. Great fun, enlightening, not to be missed! Suitable for all levels of ability - even if you can draw already, there's always room to grow and develop. Media includes pencil, charcoal, pastels, coloured pencil and water soluble pencils. These workshops are suitable for learners at all levels. Her course guides you through this lovely medium slowly but steadily, so you understand exactly what you're doing, using clear simple exercises. Observational study (working from life, not from photographs), beginning with a drawing study, then moving on to paint - understanding tonal values, colour and mixing. A variation of the Big Drawing Days - this time we use the Face as the subject, and I show you how to Look, how to understand what you see and put the information down on paper. These courses may include studying the hands as well. Many people would LOVE to draw portrait but are afraid to try. I will show you that the face is just the same as any subject. Very enjoyable. Suitable for all levels. form. Half day and full day sessions. These classes include a little bit of drawing to get everyone warmed up and ready. 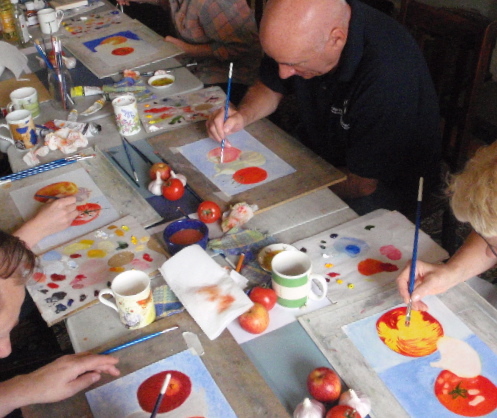 The water colour courses vary in their subject matter - still life, landscapes, skies and washes, wetter water colours, botanical subjects and tips and techniques. There is really something for all levels here. My portfolio courses are well known for their intensity, the work ethic, the long hours, but most importantly, the incredible work produced by her students by the end of it. I have high expectations, and begin by teaching students how to draw better than ever before, to try new media, project development, sketch book working, how to think creatively, to dare themselves, to work HARD, to achieve. This is a great way for students to get the feel of art college, and if they love this course, they'll know they'll love college. Suitable for students applying for any creative discipline, including Architecture.